Photo for representation only, actual product may differ from what is shown. Are you ordering the correct media? Do you need 3.5" or 5.25"; and what capacity does your drive use? 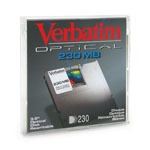 Optical disks are not cross-compatible. When will my order for this product ship? It is usually 3-7 business days, plus transit time (view map). Unless otherwise noted, when we refer to "days" on our website, it excludes Saturday, Sunday and Holidays. Copyright � 1996-2007 Diskette Connection, All rights reserved.